Over 150 animals rescued from a Chatham County farm are being nursed back to health at undisclosed location. PITTSBORO, N.C. (WTVD) -- Over 150 animals rescued from a Chatham County farm are being nursed back to health at undisclosed location. Chatham County Animal Services says the raid was the result of a two-year long investigation into neglect. The massive animal rescue operation began Wednesday afternoon. The sheriff's office called in the Humane Society of the United States to help in what rescuers called a "heartbreaking" scene. "Conditions inside the facility were obviously unsanitary. They weren't suitable for these animals, and there were a lot of issues around conditions," said Erica Geppi, state director of the Humane Society. The operation centered around the farm and mobile home on the 3100 block of Silk Hope Gum Spring Road. Horses, goats, chickens, a cow, and a pig were found along with over 100 cats and dogs, which rescuers say were living inside and out of the barn and trailer home. "We had multiple vets on scene assessing each animal as we pulled them out of the property," Geppi said. 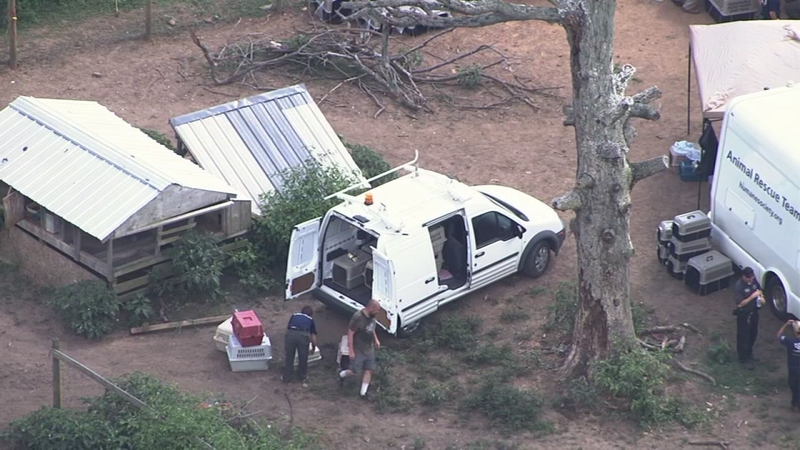 After the raid was over and the animals were removed, ABC11 tracked down the property's owner, Stephane Joostema. "We love animals. We're a rescue league! We do anything to help animals," Joostema said. Joostema admits she's been overwhelmed with keeping up her property since being seriously injured in a car wreck two years ago. But, she denied any of her animals were neglected. "If I neglected them, they wouldn't be eating. Why don't we go to Tractor Supply- ask them to look if I'm in there every other day buying cat food, dog food, horse feed!," Joostema said. She's pledging to fix up her land and get the animals back. "I am one woman. I'm overwhelmed, but I don't give up," Joostema said. Joostema will likely have a fight on her hands. The sheriff's office is still investigating, and not ruling out filing animal cruelty charges.